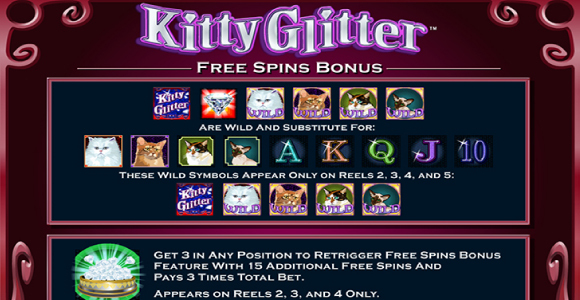 Spin the cute kitty symbols to win the Kitty Glitter slot cash prize. This 30 payline slot has 96.40% Return to Player and up to 1000x multiplier on your wager. For all the feline admirers out there we have a slot made just for you. The Kitty Glitter slot features some cats of aristocratic appearance whose only work in this world is to purr and be cute. Well, that doesn’t seem to be the only feature of Kitty Glitter slot, as there are several ways that can make the most of your wager by checking out the Kitty Glitter tips below. The bonus free spins can lead to triggering a theoretical 225 free spins that can take your bet to some incredible levels. You can start off by setting up your betting preferences by fiddling with the coins size and the paylines. The 30 paylines are not fixed and can be activated at increments of one, five, nine, ten, 15 or 30. The smallest amount that can be wagered is £1 and your biggest bet can be £100. The high value symbols that you will encounter in Kitty Glitter slot are various cats and the low value symbols are card numbers ten to ace. There are two types of wild cards – one type features four of the cats in the slot and the other one is a purple diamond with the WILD lettering across it. The Scatter symbol is a bow of diamonds. Three of these symbols help you land 15 free spins which can be retriggered a number of times by getting additional three of the same symbols. The purple diamond symbol is a Wild during the free spins mode. The most important feature that can multiply your winnings is the Free Spins, which can be retriggered. You can start playing the slot machine on a low to medium wager to see if the frequency of wins is disposed kindly towards the beginning. Because the slots are random win generator there isn’t really a certain way to secure a favorable winning outcome, but there is a way to prolong your play in favor of anticipating a bonus feature being granted or a multiplier on your wager. Another set of Kitty Glitter tips is regarding the paylines. Because the paylines can be increased or decreased at increments, you can try playing on fewer paylines with a bigger coin size or you can invert that choice and play more paylines on a lower coin size. This will help you gauge how the winning intervals and be lucky enough to score a big win at the onset of your play. Just to point out, Kitty Glitter is both a digital slot and a land-based casino video slot. This is telling of its appeal and the fact that it attracts players and that translates to cash prize becoming amassed and waiting to be won.